Sextus Empiricus (lived during the second or possibly the third century C.E. ), was a physician and philosopher whose philosophical writing is the most complete surviving account of ancient Greek and Roman skepticism. He followed the tradition established by Pyrrhon, and maintained that skepticism came about through sincere examination of the various schools of philosophy, none of which offered a satisfactory and comprehensive solution to the basic philosophical questions. Therefore all judgment should be suspended, in order to achieve tranquility of the mind. Sensory evidence was admissible only as a subjective claim, true according to one person’s perceptions but not necessarily true for anyone else. Philosophical theories were not needed in order to respond appropriately to the practical needs of everyday life. In his medical work, tradition maintains that Sextus belonged to the "empiric" school (see Asclepiades), as reflected by his name. However, at least twice in his writings, Sextus seems to place himself closer to the "methodic" school. Almost nothing is known of Sextus Empiricus’s personal life, including the dates when he lived, which could have been during the second century or early third century C.E. He has been variously reported to have lived in Alexandria, Rome, or Athens. Sextus Empiricus's three known works are the Outlines of Pyrrhonism (Πυῤῥώνειοι ὑποτύπωσεις), and two distinct works preserved under the same title, Against the Mathematicians (Adversus Mathematikos), the second of which is probably incomplete. Adversus Mathematikos can be translated as Against the Learned. The first six books of Against the Mathematicians form a self-contained whole that is often referred to as Against the Professors. Each book targets a different area of expertise; grammar, rhetoric, mathematics, geometry, astrology and music (Against the Grammarians (book I), Against the Rhetoricians (book II), Against the Geometricians (book III), Against the Arithmeticians (book IV), Against the Astrologers (book V), Against the Musicians (book VI)). It is widely believed that this is Sextus' latest and most mature work. Five additional books under this title, sometimes called Against the Dogmatists, contain arguments against Logicians, Physicists and Ethicists, and the set appears to be incomplete. Outlines of Pyrrhonism consists of three books. The first is a summary of Pyrrhonian skepticism and appears to correspond to the portion that is missing from the second part of Against Mathematikos. The second two books are arguments against logicians, physicists and ethicists, worded more concisely than the arguments of the second part of Against Mathematikos; some of the views presented, however, differ considerably from those of Against Mathematikos. 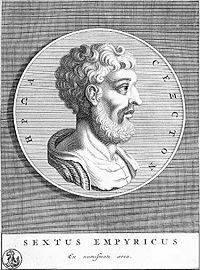 In addition to his philosophical works, Sextus also wrote some medical treatises (referred to at M 7.202, 1.61) that are no longer extant. Sextus Empiricus distinguishes three basic types of philosophers: dogmatists, who believe they have discovered the truth; academic skeptics, who believe that truth cannot be discovered; and skeptics, who continue to investigate with an open mind, not believing that the truth has been discovered yet, but not discounting the possibility that truth can be discovered. In his works he constantly attacks the academic skeptics' claim that nothing is knowable, pointing out that such a statement is itself a belief. Sextus Empiricus suggests that the ultimate goal of philosophical research is to achieve tranquility, or a state of ataraxia (roughly, “peace of mind”). A philosopher does not start out as a skeptic, but becomes one through close examination of different systems of belief. For each argument that purports to establish a truth about the world, the philosopher finds that there is an equally convincing argument establishing an opposing and incompatible view of the same thing. Unable to accept that either view is correct or incorrect, the philosopher suspends judgment. The philosopher then finds that by suspending judgment altogether, and giving up the expectation that it is necessary to acquire truth in order to achieve tranquility, he has unexpectedly arrived at the tranquility that he sought. Holding on to definite views is, according to Sextus Empiricus, the main source of psychological disturbance. If certain things are held to be intrinsically good, a person will feel disturbed when he lacks them, and go through suffering to protect these good things once he acquires them. A skeptic does not judge anything as intrinsically good or bad, and so avoids these psychological difficulties. Sextus Empiricus allows that we may affirm claims about our own sensory or emotional experiences. It could be true to say, "it seems to me now that X." However, he points out that this does not imply any objective knowledge of external reality. While I might know that the honey I eat tastes sweet to me, this is merely a subjective judgment, and as such may not tell me anything true about the honey itself. In his explanation of the skeptic attitude, Sextus Empiricus includes a discussion of the Ten Modes of Aenesidemus, and a set of Five Modes apparently employed by Agrippa to counter the positive statements of other philosophical systems: disagreement (among philosophers there is always disagreement); regress ad infinitum (the skeptic asks for a proof of a claim, a proof of the reliability of this proof, and so on ad infinitum); relativity (all beliefs are relative to one's subjective nature and one’s previous experience); hypothesis (the skeptic does not allow the use of a presupposition a starting point for an argument); and circular reasoning (the skeptic rejects proofs that are circular, such as saying that because we smell something, the sense of smell exists). He also reduces these further to Two Modes. Sextus does not necessarily propose that these modes are all-inclusive, but uses them as examples of the types of reasoning employed by the skeptics and includes many other examples. Pyrrhonic skepticism does not deny the possibility of knowledge, but advocates suspending judgment about whether or not anything is knowable. Skepticism is not simply a philosophical exercise; it is a way of life. Sextus Empiricus applies skeptic methods to many aspects of everyday life. He does not think a general suspension of judgment to be impractical, since we may live without any philosophical beliefs by using our natural capacities for perception and thought, and acting according to natural feelings, laws and customs, habit, and previously acquired expertise. An influential edition of Sextus's Outlines with a Latin translation was published by Henricus Stephanus in Geneva in 1562. Outlines were widely read in Europe during the sixteenth, seventeenth and eighteenth centuries, and had a profound impact on Michel de Montaigne and David Hume, among many others. Another source for the circulation of Sextus' ideas was Bayle's Dictionary. The legacy of Pyrrhonism is described in Richard Popkin's The History of Skepticism from Erasmus to Descartes and High Road to Pyrrhonism. Some of his skeptical arguments resemble those made by the 1st century CE Buddhist philosopher Nagarjuna. Patrick, Sextus Empiricus and the Greek Sceptics (1899). (The last English translation of the complete works was Bury, R.G. Sextus Empiricus, in four volumes (Loeb Classical Library: London and Cambridge, Mass., Vol. I 1933, II 1935, III 1936, IV 1949). Floridi, Luciano. Sextus Empiricus: The Transmission and Recovery of Pyrrhonism (American Philological Association American Classical Studies Series). An American Philological Association Book, 2002. This page was last modified on 10 September 2015, at 19:15.